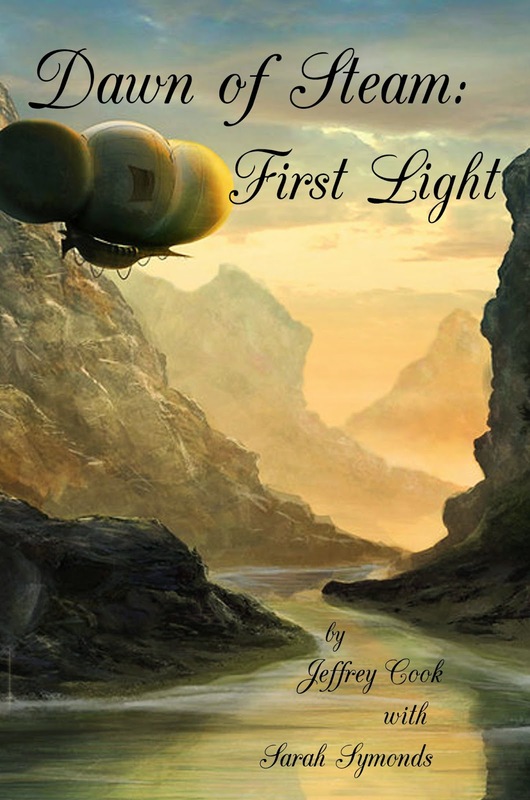 Today I am happy to share a short excerpt from Dawn of Steam: First Light, a steampunk novel by Jeffrey Cook and Sarah Symonds. As an added treat, the Kindle ebook is currently discounted until 23 April, so get in quick by clicking HERE. Gregory Conan Watts has been hired to prove the impossible. To do so, he’s expected to assemble a crew that includes war heroes, carnies, respectable women, and one wilderness scout who may or may not be entirely insane. They’ll have the best of 1815 technology: a state-of-the-art airship and the steam-powered battle suit that almost single-handedly brought down Napoleon’s alliance. Finding vast uncharted wonders Gregory’s not even sure are there sounded complicated enough; he wasn’t expecting natural disasters, outright sabotage… or another war. Somewhere in the chaos I lost track of Giovanni Franzini and assumed he’d crawled under a table or under some rock to hide. He quite surprised me later, when we learned he’d run down two of the assassins who had attempted to flee in the chaos and felled both, albeit from behind as they were running.